An arrival at the Tap Gallery theatre ‘underneath’ is a little like (in this instance) stepping into Christina’s cupboard with her. It’s an intimate, tiny theatre tucked at the back of an art gallery that flows quite naturally through, sectioned off by curtains, shrouded in white and yet somehow carrying with it the ‘good energy’ of all the marvellous plays that have gone before it. As we learn, at the start of Christina in the Cupboard, solitude and reflection are not just opportunities to get away from the world. Sometimes they are the only way to get in touch with the world, to get broader perspective and lift one out of the routine funk that ‘workrestplayworkrestplay’ can provide. 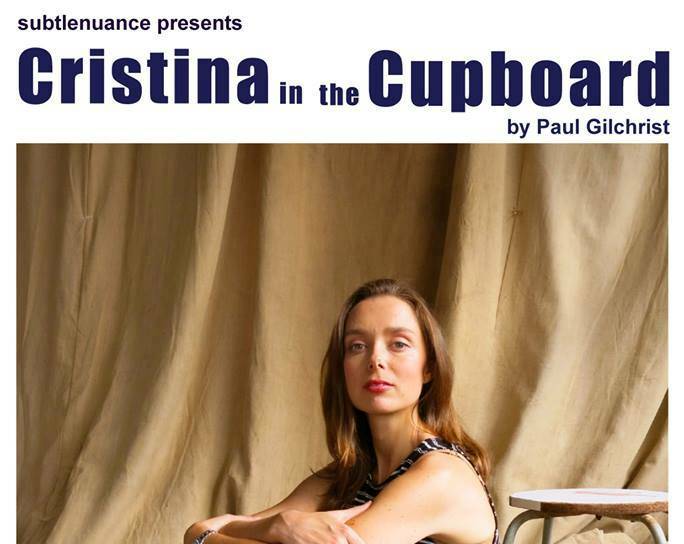 Paul Gilchrist’s Christina in the Cupboard asks many questions, but one of its more prevailing issues is the question of solitude and the genuine cost of our relationships with the ‘others’ in our lives. This central question speaks to the heart of theatre itself. Theatre is so much about our relationships with others, but what of our inner world? Christina (Played by a resplendent Sylvia Keays) a young woman, whom we presume to be quite young, simply steps into a cupboard one day and doesn’t come out. She is not listening to music, or watching film, or texting friends or talking on the phone or even thinking about dinner. She has simply stepped apart from the world for as long as it will take for her to be able to return to it with confidence and inner strength. Throughout the course of the play, those with whom she shares her deepest relationships, her parents, her sister, her friends and her boyfriend come to the cupboard door to try to coax her out. Her friends use the importance of peer respect (a series of funny, quirky references to social media) her sister uses the importance of being needed and necessary, her parents use love and obligation and her boyfriend (a charming Stephen Wilkinson who wears his awkward heart on his sleeve) uses the guilt and fear Christina’s actions seem to have implanted in him. None of these persuading arguments work in bringing Christina out of her isolation, which is really a stand for something larger. 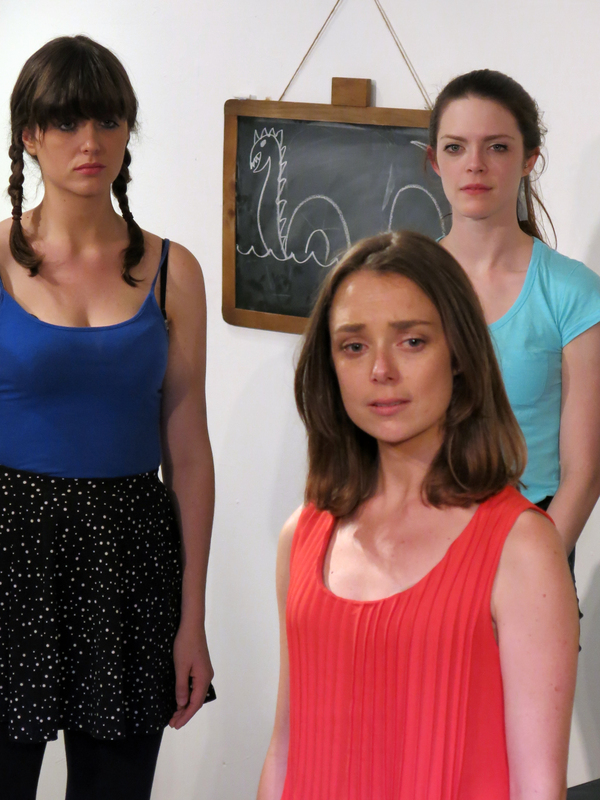 Many famous myths and legends are used within the play, but throughout it all Christina will seem to be a modern-day Job, waiting patiently for release from the clutches of her own personal Leviathan, refusing to be persuaded by contemporary arguments’ attempts to twist her actions away from her right to determine her experience in her own words. Every Child is taught by every parent what’s normal. Hide and Seek. The fun part is when you lose. The attempts to coax Christina out of her cupboard (a nice twist – in order to escape her inner monster, Christina has fled to the place where monsters come from) are source for the bulk of Gilchrist’s words and form a battle between the inner world and outer world before the audience’s eyes. Christina is not physically locked in the cupboard, and Gilchrist has her walk about observing her loved ones as they gather at the cupboard door and plead their case. Initially, the temptations of the world are superficial, represented by the three friends (another Job reference) who speak in tweet like vignettes about who is the most popular on Facebook, and the place of competition in the world of friendship. Christina answers this with the cry for friendship to be a genuine acceptance of difference. 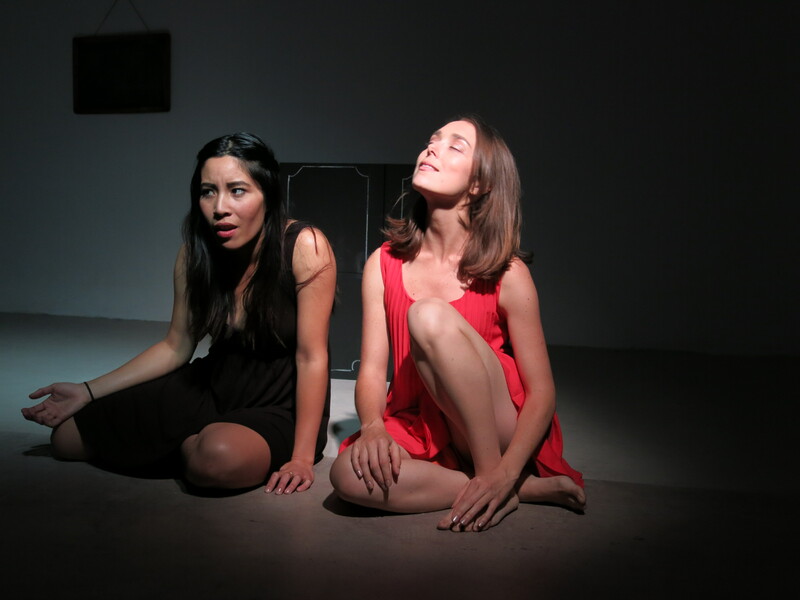 Soon Christina’s sister Anna (an elegant and beautiful Alice Keohavong whose strong presence matches Keays’ sublime gentleness) will cry at the door, offering up her loneliness, her longing and her admiration for her bigger sister. Gabriel (Stephen Wilkinson) moves around Anna, fearful of a shared kiss Anna witnessed that may have been too much too soon, begging Christina to come out, more for a relief of his own inner fears than any understanding of Christina’s position. If I were satan I would appear sensible, because that’s where misery lies. But it’s when Peter McAllum as Christina’s father Robert and Helen Tonkin as Christina’s mother Gwen take the stage that the real questions of an individuals right to lock themselves away for an extended period of deep solitude takes on its more complex meanderings. One can’t move toward silent solitude without withdrawal from the other, and it is usually parents who have the deepest bonds with their children and parents who feel they can exert the most pressure. Gilchrist writes searing questions into the brilliantly delivered narrative, as in the absence of response, the parents are forced to examine themselves in the mirror Christine becomes. 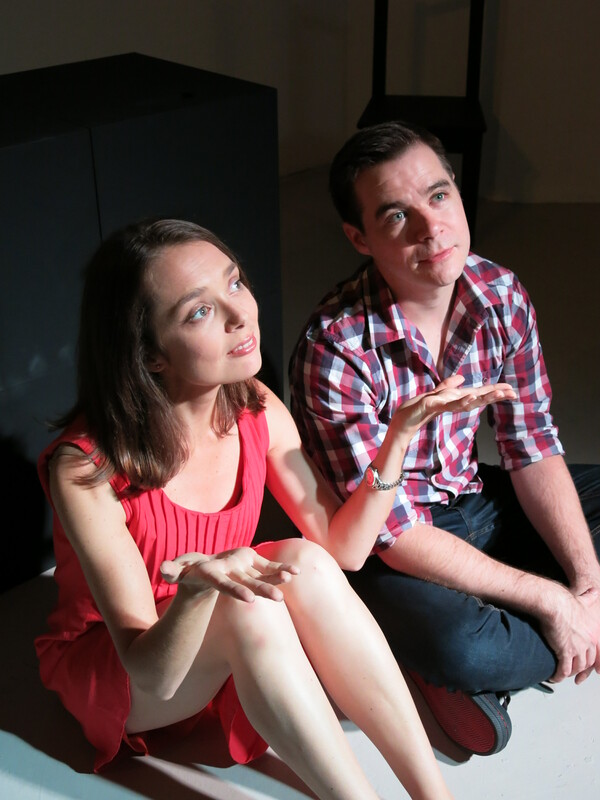 It’s a beautiful little theatre moment, splendidly written, very funny, and perfectly performed, as Keays, Tonkin and McAllum delve to the core of the aching human heart searching for time to heal. A day can be forgiven, even a week. But as the days and weeks stretch on, food disappears at the cupboard door, and no sign of an end is forthcoming, how are parents to escape the questions of the sanity of their child, themselves and the world they brought her into? When I met your father I made a choice. Later I wondered if I had made a mistake. Throughout all the questioning, Kelly Robinson plays Lucinda, the friend who questioned at first and soon becomes a mirroring quiet presence, hovering on the outside of questions, making her own way through the maze of understandings. She is the most abstract of all the characters – even more so than the enigmatic Christina – and in may ways she is the audience, watching Christina from our silence, but never from our solitude. We are left in the end, envying Christina and her courage, and this is precisely Gilchrist’s point; That the act of separation solitude is a lost art, and needs a certain sort of revival. After all, it is deep inside the swirl of our personal sunflowers that the universe resides.